This is article six from John Royer, a man living as humorously as possible with PSP. It’s the middle of May and I feel better and I haven’t fallen once. My early-morning dizziness is still with me but it is not as bad as it used to be. My walking varies from hour to hour. Double vision to the left and the right is still there but I’m acclimated to it. 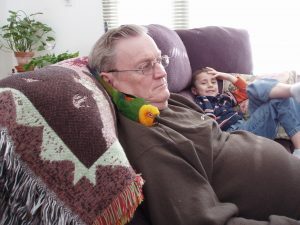 At night around 8 o’clock I like to lie on the sofa with the larger parrot that nestles at my throat and goes to sleep. I like the political news and the science shows mostly so Mary goes in the other room to watch her detectives. The little parrot falls asleep in her cage hanging from the wall. I don’t care about the little one because whenever she’s out she bites me. I feed her and give her water every day and that’s what I get for my efforts. Mary can have the little squirt out and do anything with her. Within an hour the larger one has pulled her legs up and is actually lying on my chest fast asleep. Her warmth feels good against my neck. The problem arises when I try to get up. I coax her onto my finger and she squeals a little bit because she wants to stay where she’s at. It’s 11 PM. Now it’s time to stand up. A problem arises. I try to stand up and I fall backward. The bird looks at me like I’m an idiot. Birds can do that. 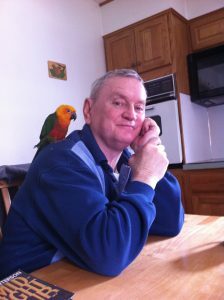 So there I am with a parrot on my left finger on my left hand trying to stand up but falling back onto the sofa. All day I had been walking well and getting up without any problem but once I lay down for a while my body starts to regress. Eventually, I work my way forward on the sofa and put my arms out, the bird still giving me a funny look, lean forward, and stand up flexing my legs as hard as I can so that I can get all the way up. Then I have to stand there for a few seconds while my dizziness stabilizes. Finally I can start to stagger back to her cage to put her in. Three hours of inactivity has ruined my ability to walk comfortably. Mother Nature is sticking it to me again. Inactivity seems to be an enemy of mine. The more I walk, the better I get. I cannot for the life of me figure out why this happens. In the morning when I get up I go through the same scenario. During the day I go to a website that I have discovered along with one other. This one is called https://ftdregistry.org/ and is a site devoted to letting people with neurological disorders like PSP participate in surveys and possible clinical trials. FTD stands for Frontotemporal Degeneration. I have registered and have taken three surveys to date. The other is called https://rarediseases.org/ and it is interesting to read. Its title is NORD, National Organization for Rare Disorders. It tells you all about the huge number of rare physical disorders that exist. I believe there are 1,200. Like the other one, it is interesting reading. Of course, CurePSP is an excellent data source as well. I just have a habit of looking at many sources of information. Now I have three. Ironically, I can only read so much of it because it gets depressing. I hate being depressed. Fun is much better. I have an insatiable desire to learn as much about PSP as I can. It won’t help you get better but knowing a problem is better than not knowing it. It’s as if I’m taking control of my illness even though, in truth, I am not. It’s simply the idea of understanding the problem that I have and that you have or your loved one has. I’m still having the problem of processing information. I hear the words but I have to take my time interpreting them. This is frustrating. But is part of the disease. I also have trouble if I talk too quickly because I get my words garbled, so I talk slowly. It’s not that noticeable but it occurs. Understanding it is important. I always roll my eyes and Mary laughs as I try to be comical when I screw up. She appreciates it that I do not get down in the dumps when it happens. Once again, funny is good. There is a lady in Toronto that would like to come down and do an interview with me and I have communicated with her and told her that it would be fine. She’s doing a documentary on PSP so I’m sure she will understand if I have to talk slowly. I will do my best to insert humor into the interview. Also, her mother has had PSP so she is cognizant of the difficulties with speech. I look forward to meeting with her sometime in the next few months. Remember to take the time to laugh at yourself.